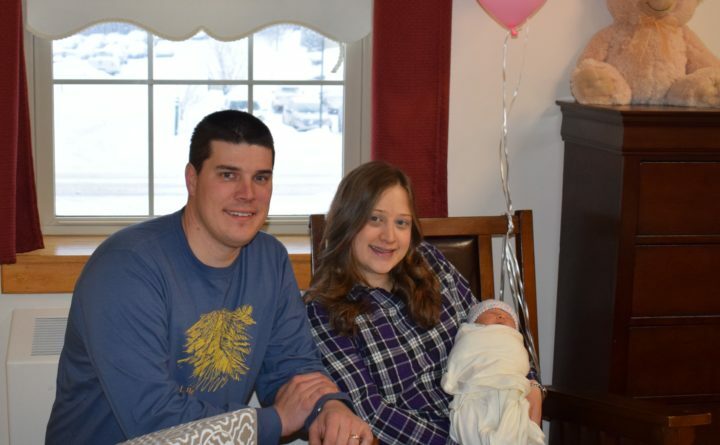 FORT KENT — Northern Maine Medical Center is pleased to introduce its first baby of 2019, and to extend warm congratulations to the family. Evelynn Audrey Boucher was born at 11:27 a.m. on Jan. 8, 2019, to Melinda and Brien Boucher, residents of Fort Kent. The maternal grandparents are Colette and Jeffrey Plourde, and paternal grandparents are Wendy and Riki Boucher. The baby weighed in at 6 pounds, 1.6 ounces and is the couple’s second child. The Bouchers’ first born is a 2-year-old son, named Connor. Baby Evelynn was delivered by Dr. Kristin Hartt. In keeping with a long-standing St. John Valley tradition, the first baby of the New Year received a gift basket, valued at just under $900, filled with baby supplies, toys and services, all donated by area businesses and individuals. Joining NMMC in contributing to this year’s gift package are: Rebecca’s Photography, Rock’s Family Diner, Acadia Federal Credit Union, Cloud 9 Spa, Fish River Rural Health, Paradis Shop ‘n Save, John’s Shurfine, Pelletier Florist, Northern Quilters, Pauline Bouchard, United Insurance, Jim’s Custom Hats and T shirts, Key Bank, Valley Eye Care Associates and the NMMC Guild. Evelynn, along with all other Maine resident babies born in 2019, will be eligible through the Harold Alfond College Challenge to receive a $500 grant to start a NextGen College Investing Plan® account. Beloved philanthropist Harold Alfond established this program before he died to ensure access to higher education for all Maine’s children. All Maine resident babies can receive the grant if they are enrolled on or before their first birthday. To receive this grant, no income limit is considered and no contribution of additional monies is necessary.